We are committed to working with you on a creative design that reflects your style while maximizing the potential of your space. Our systems ensure that every aspect of your project from concept to completion is handled with clear communication and care for your home. 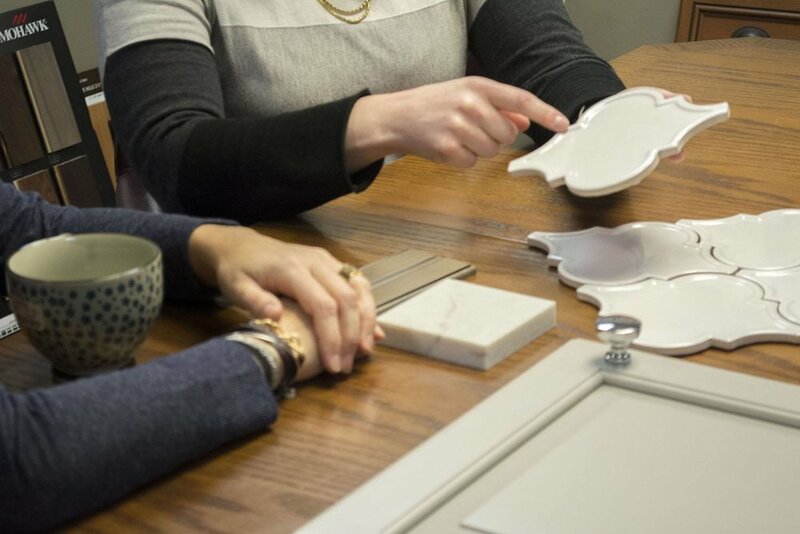 Initial Consultation - On the phone or in our showroom, speak with a designer (your contact throughout your project) to discuss your project, your goals, and your budget. Scheduled Home Meeting - A designer will meet with you at your home to do a site review, discuss the scope of your project, and give you a ballpark estimate. Your design agreement and retainer will let us know you're ready to start design work. They will then take measurements and photos to begin preparing your customized design. Follow-up Concept Meeting - In our showroom, your designer will get more specific on the details of your style with materials and inspirational images. Design Presentation Meeting - Your designer will review a computerized rendering of your project as well as a detailed estimate of the costs involved with each step of your project. You will approve and sign your contract to then be added to our production schedule. Selection Meeting - Your designer will have choices of materials with photos so you can approve all of the final details and components for your project. Pre-construction Meeting - On the job site with your designer and lead carpenter (who stays with your job until completion), you'll discuss the details of our employees working in your home such as where to enter, job site work areas, pets, and removal of materials. We cover floors, seal off areas when necessary, and clean up the job site each evening. Project Construction - Weekly meetings at the job site with the designer and lead carpenter make sure things are going smoothly. They will review progress, answer design questions, and discuss any changes or additional work if necessary. Final Completion Walk-Through - Your designer and lead carpenter tour the completed space with you to make sure you are completely satisfied and that everything meets our high standards for quality. Five-Year Warranty - We stand behind the quality of our work with a warranty on all of our labor for five years after job completion.